HELLO!!!!! 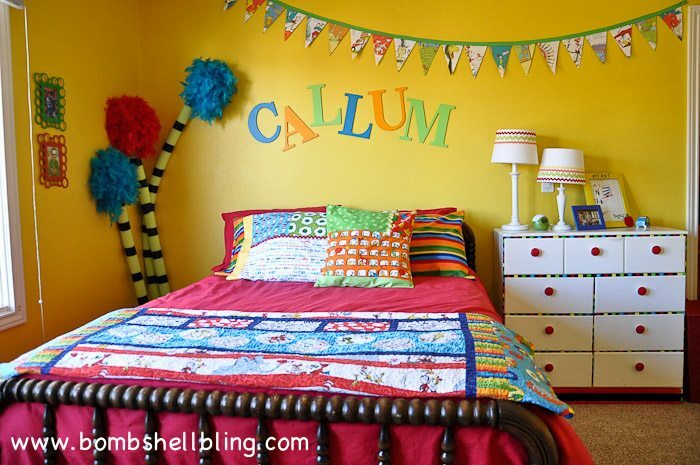 I am SO EXCITED to show you my son’s Dr. Seuss bedroom. I have been working on it for soo long, and I am immensely relieve that it is finally finished! Today I am going to flood you with pictures and share where I got a few things, but there will be many tutorials to come in the future, don’t you worry. Are you ready? I am! Eeek!!! 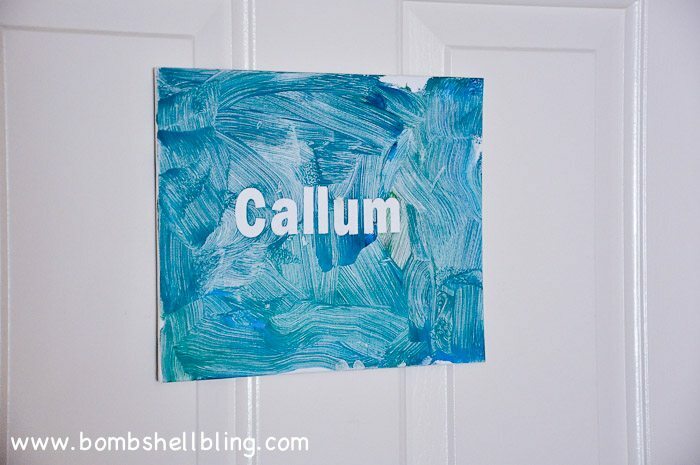 Welcome to Callum’s room. Come on in, and prepare to see some COLOR! I love this view. It’s just so dang cheery, dontcha think? 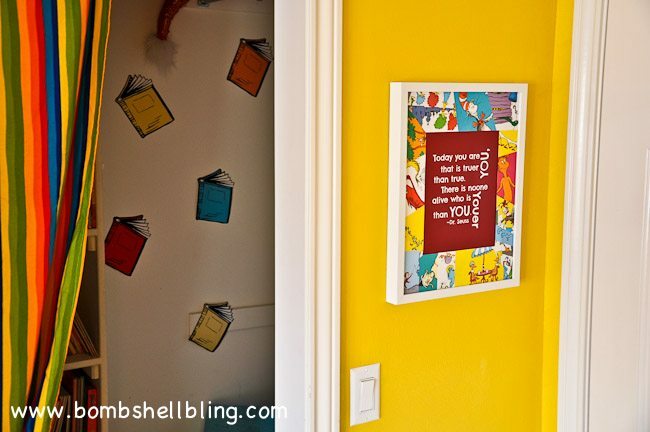 As you enter the first thing you see is a quote from Dr. Seuss framed by a book page collage (printable and tutorial HERE). And just past the frame…..the closet reading nook! 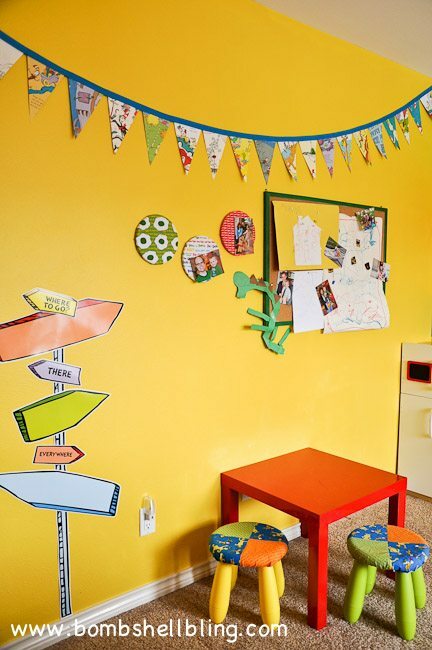 This is probably my personal favorite part of the room because I love used to teach elementary school, and I have a children’s literature obsession, so I love that my son is so excited about reading in his reading nook. It is full of most of my former classroom library, and it is even jazzed up with some Dr. Seuss cutouts that I found at Michael’s in the teacher section of the store. My boy was particularly blown away by that giant Cat in the Hat! Moving on from the closet into the main room. I love this view! Can I tell you about the things in this picture? The bedframe is an antique that belonged to my grandmother. I love it. The dresser is a hand-me-down from a friend that I painted way back when I was pregnant with my sweet boy. Luckily the colors that I picked still work. We will talk about the things on top of it in a minute. 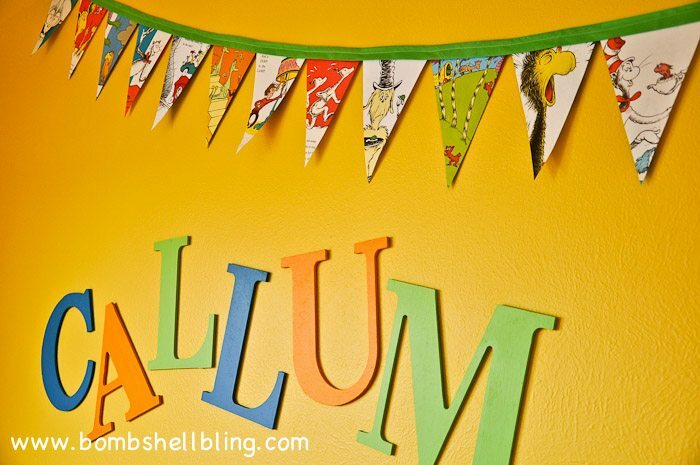 I made the pennant banners using old Dr. Seuss books. The name is large wooden letters from Hobby Lobby that I painted. 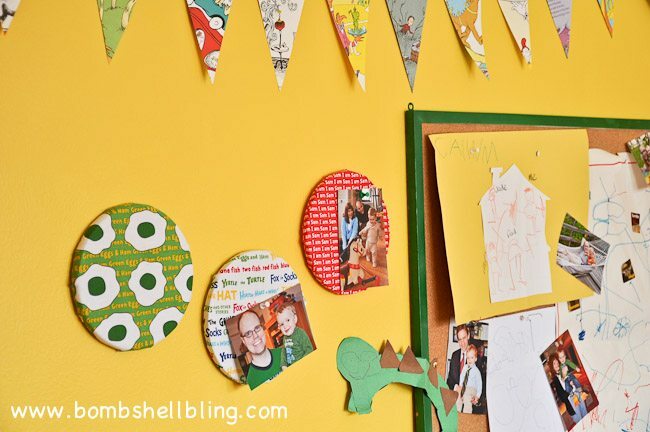 I put them up by glueing thumbtacks onto the back of them and then pushing them onto the wall where I liked them. The lamps are two thrift store finds that I spray painted white and got new lampshades. 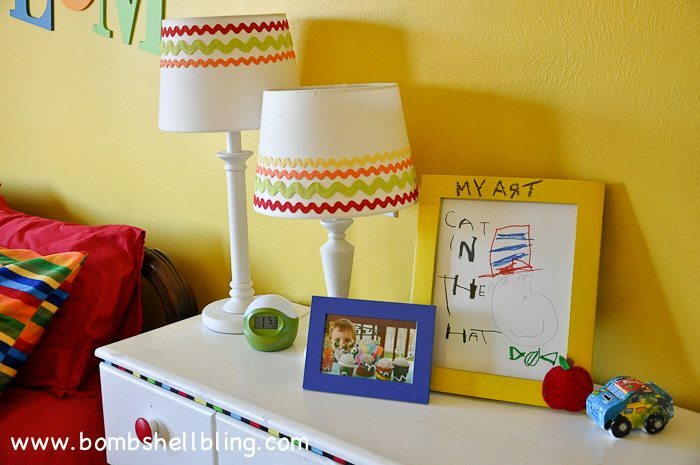 The lampshades were simple ones from Target that I jazzed up with ric rac and hot glue. I just love ric rac. It’s so whimsical! 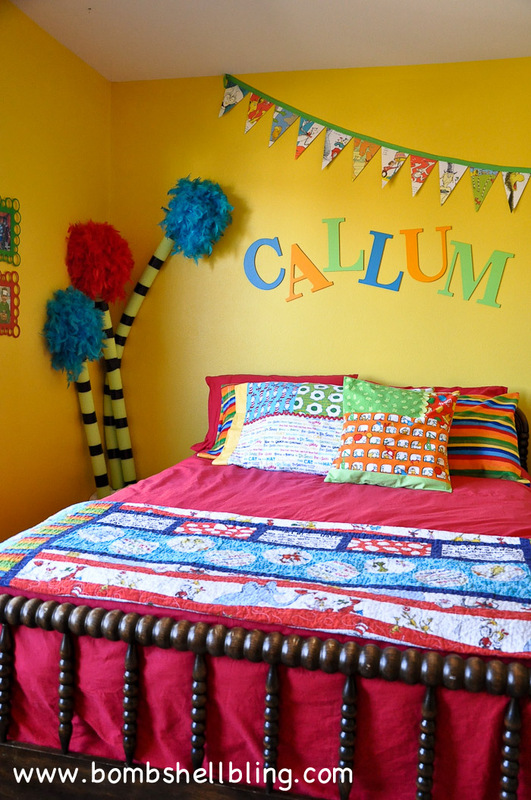 Callum’s bed got a Dr. Seuss makeover thanks to Ikea and the Robert Kaufman line of Dr. Seuss fabric. I used an old comforter from my parents’ basement and gave it a new look with a red Ikea duvet cover. 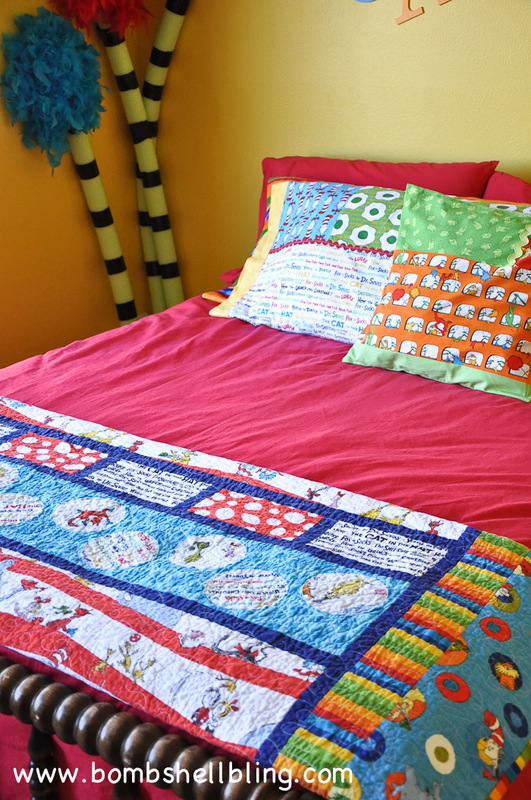 The ah-ma-zing quilt is courtesy of my mother-in-law, and the pillows I made. (She actually gave him that quilt years ago, and when I was deciding what to do with his room I decided to build it around that quilt because I love it so much!) Here is a tutorial for the patterned pillows, and the tutorial for the cuddle fabric body pillow case is coming up very soon. It’s TRUFFULA TREE TIME!!!! Aren’t they silly and fun? My boy is CRAZY about them! Those silly frames are from Ikea. I love them! Now take a look at the other side of the room!!! THE STRIPES!!! I wanted to do rainbow colored stripes, but everyone acted like I was crazy. I did it anyway, and I am so glad! 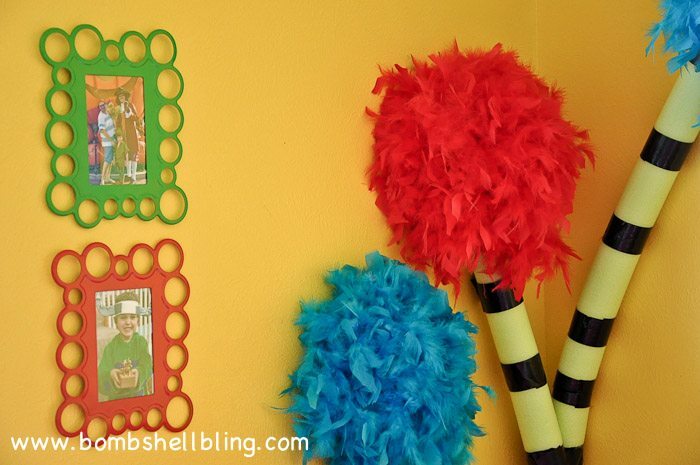 I think they give the room just the right Seuss-y feel. What do you think? 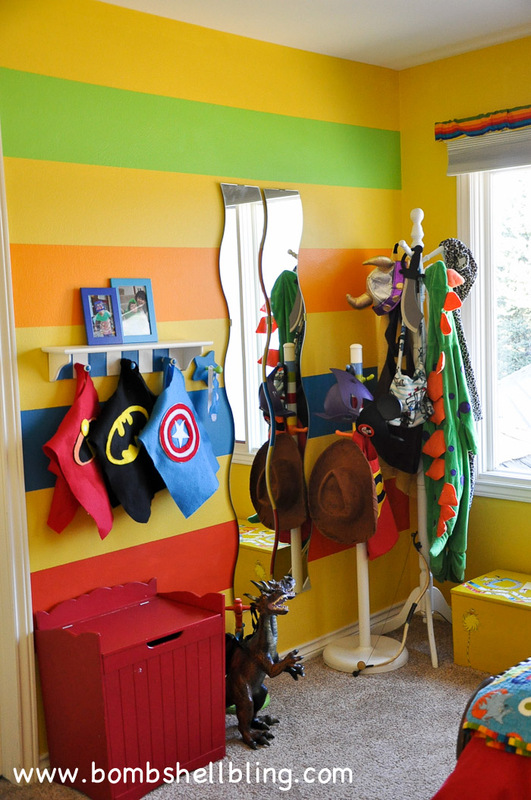 My son’s favorite part of his new Dr. Seuss room is the dress-up corner. I LOVE his imagination. It is on hyperdrive 100% of the time. He runs around living in his own little dream world. I love hearing his stories about the worlds and games in his mind. I was the same way when I was little, so it brings me great joy to make and buy him costumes and props. In this picture you may spy his dragon and cheetah costumes, made by my mother-in-law. 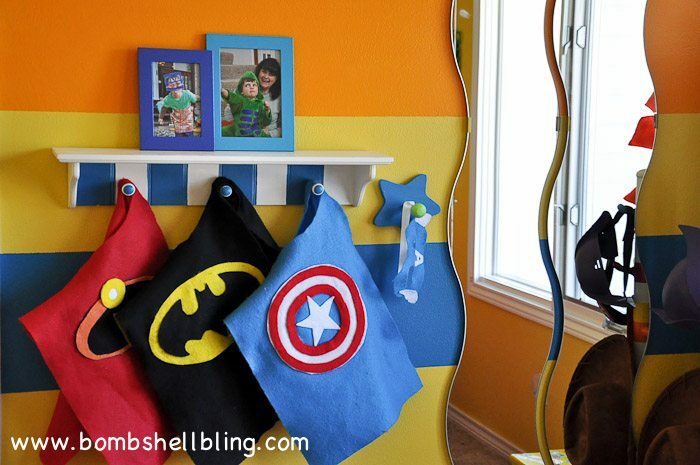 You can also see the no-sew superhero costumes that I made for my boy last year hanging on the shelf that I painted with blue stripes. I think the wavy Ikea mirrors add just the right touch. 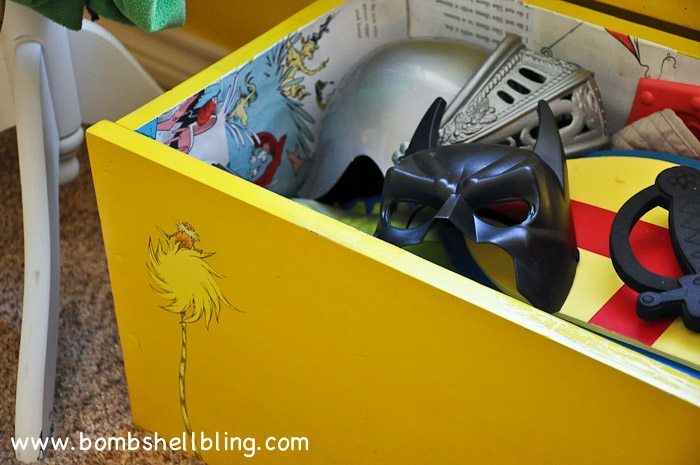 I made over a wooden toybox for the dress-up corner as well. A post is coming on that as well. Well, what do you think? Do you love it or is it way too over the top for you? (Just say it in a nice way, please!) It speaks to my elementary school teacher soul. 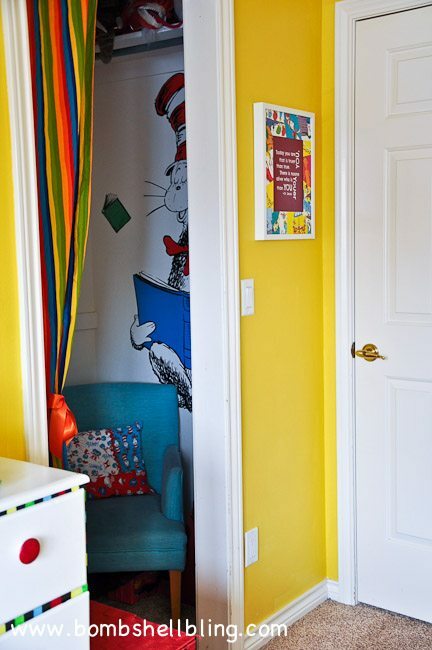 Last night in his bedtime prayer my boy said, “Thank you for Mommy making me my Dr. Seuss room.” Worth the months of work? Ummm…..yes. A big, resounding yes! Here are a few Before & After shots for your enjoyment. I am so thrilled with the change! Thank you for stopping by, and be sure to check out his little sister’s sweet, girly nursery as well! « From Ikea Footstool to Custom Made Storage Ottoman! Wow! 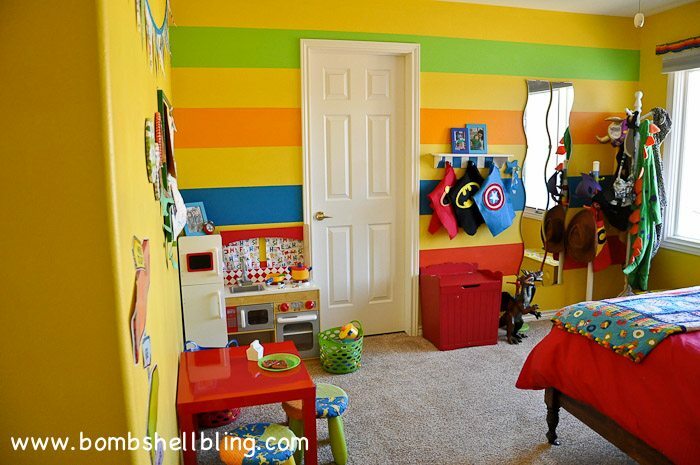 His room is amazing! You did a great job on it! I truly love the Truffula trees! I like how even the littlest things tie into the theme of his room, like the seat covers, alarm clock and the direction sign. Oh and the reading nook is also a favorite of mine! This room is so awesome!! 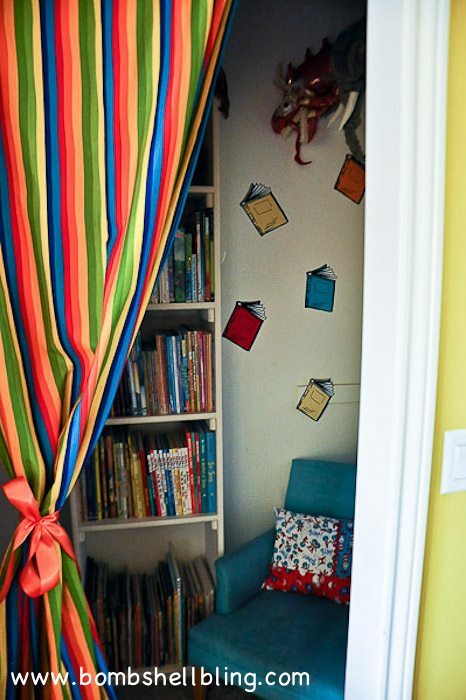 What a fantastic idea for a kid’s room and fostering a love of reading-especially the special reading nook!Love it all, and I wish my kids were still young enough for me to do it! Sarah it is beyond amazing!! You are so insanely talented and I love every single thing! 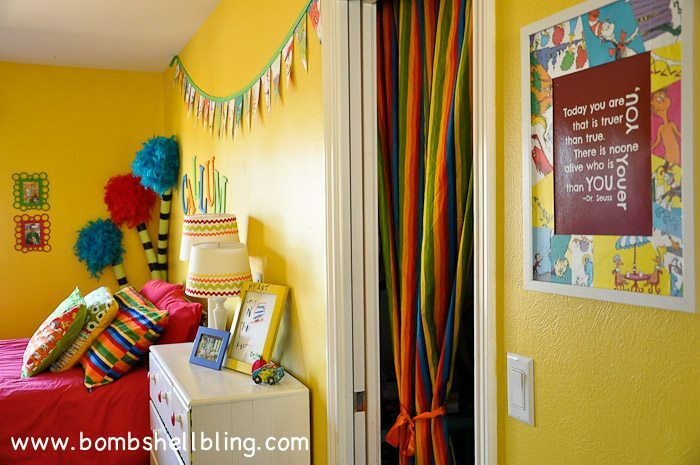 My favorite are the stripes, the creative dress up station and all those fun pillows! What a room! THANK YOU, Friend!!! Love you!! I love it! I think it is so fun and colorful! 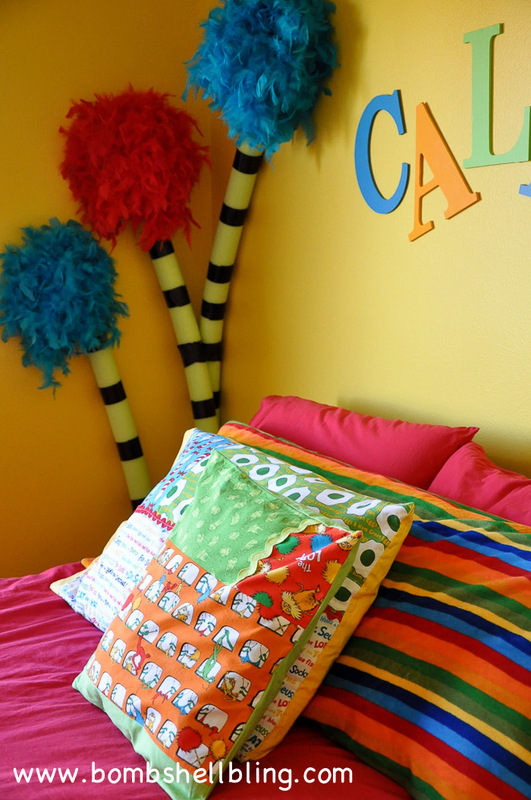 I just designed my first kid’s room (we are expecting our first baby any day) and very seriously thought about doing a Dr. Seuss theme. I am seriously regretting it now. Maybe some day. There are so many interesting details. SEUSStastic! That closet reading nook is so cool! My daughter has the perfect closet to do that. I’m inspired by so many of your ideas. I love all the ric rac and the wavy mirrors! The quote with the book page mat looks amazing too. 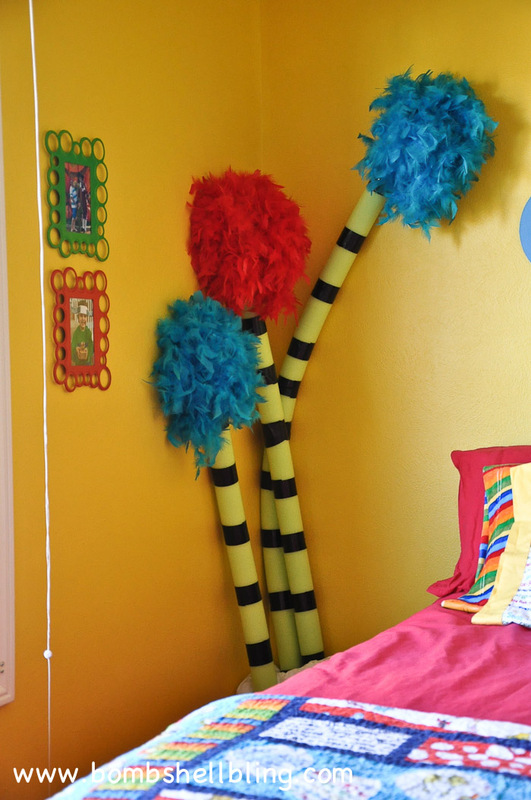 The truffula trees really make a nice statement and grab your eye and tell you Dr. Seuss as soon as you enter the room. 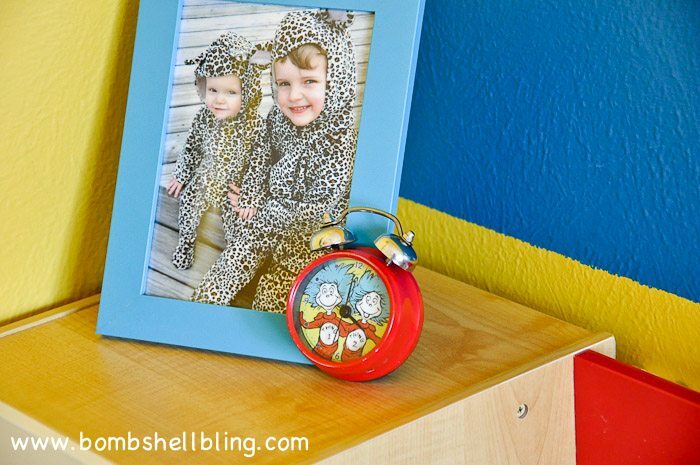 I love his dress up box too with Dr. Seuss touches. So many fabulous details! I’ll grab a few pics to feature and link them here to see more. Your son is so lucky to have such a creative mom! Great job, sister!! Looks amazing! It is perfect. I am a fellow dr Seuss lover, and love that you finished it right around Dr Seuss’ birthday! Callum will be loving it for a long time. Well done!!!! 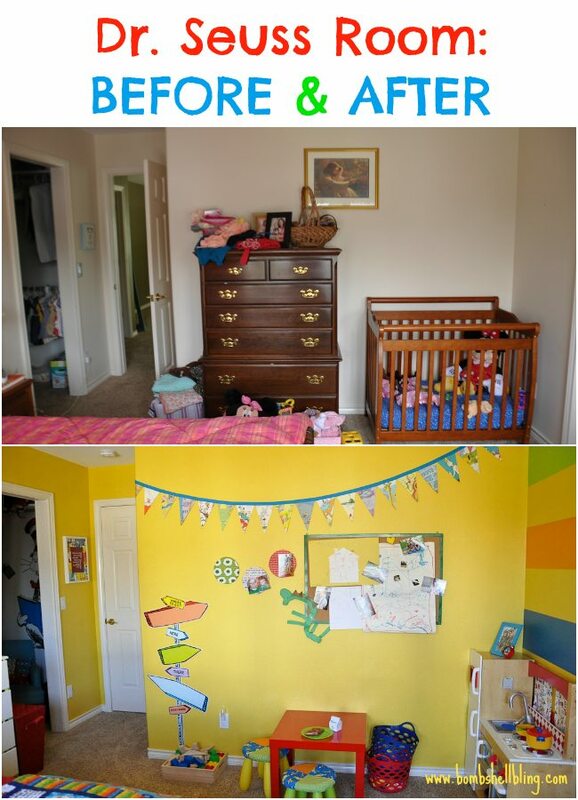 This is so dang cute–great job on the room! I love it, the reading nook is fantastic. This room is SO. Dang. Fun!!! Love it 😀 He’s going to enjoy that for along while….FABULOUS job, Sarah! Love it!! Dr Seuss is a favorite in our home (and when I taught in the classroom). 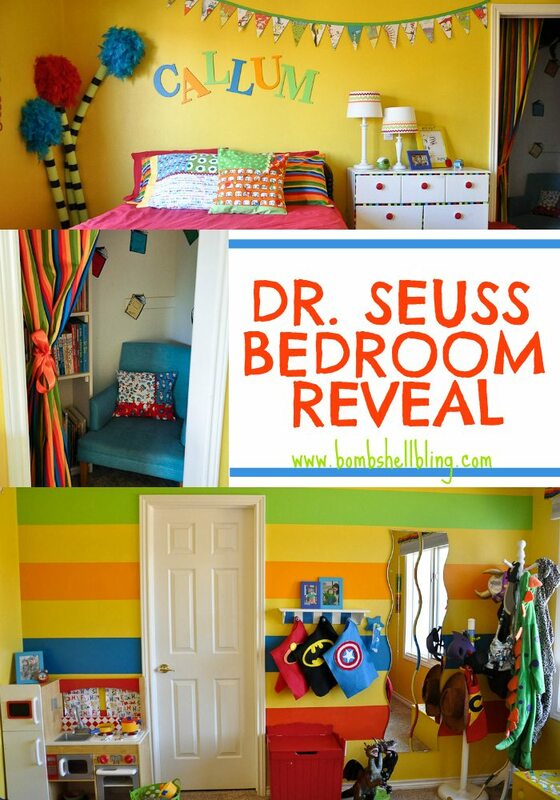 This is an AWESOME room & it has just the right amount of “quick” to make it Seuss-y!! 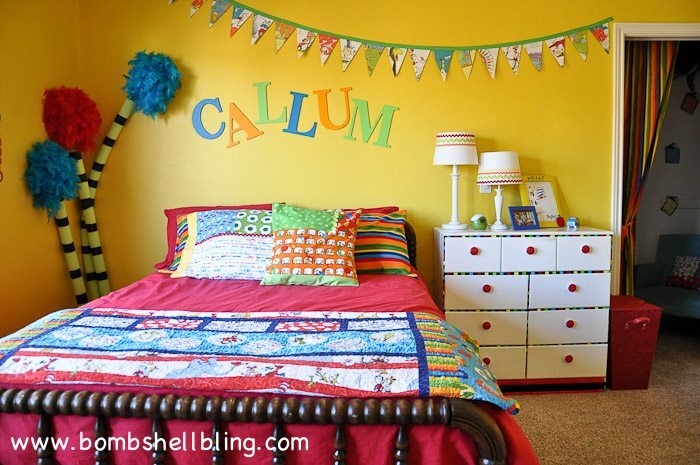 I’m sure your boy adores his room. Well done! Oh my goodness!! 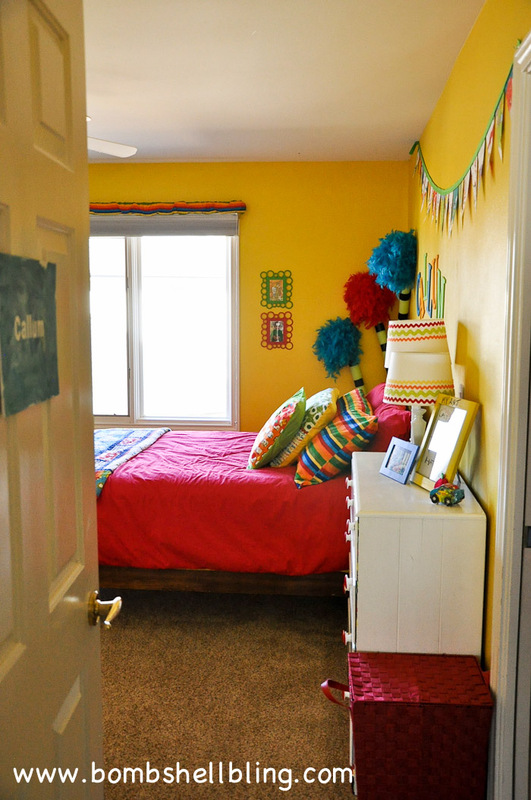 What an adorable room! LOVE all the colors! Love, love, love it!! It’s amazing!! You did an incredible job. It makes me wish I were a kid again so I could play in the room. Thanks for the tip about hot glueing thumbtacks to the back of the letters…great idea!! The room rocks!!!! Love it. It’s perfect for a little boy’s room. I’ve been looking for a way to paint my daughters room for ages and everything for girls is pink pink pink! 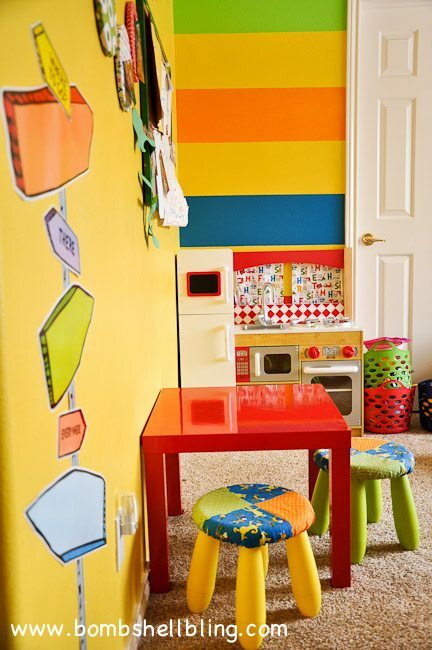 I know that I have already told you in person that I think this is a fabulous space, but it can’t hurt to hear it again 😉 I love how colorful and how fun and how Sarah this room is. My mind would never be able to come up with such a colorful space. Not only did yours, but you made it happen! Callum is one lucky boy! Seriously Sarah – this space is absolutely amazing!! I can’t believe how much care and detail went into this but it is perfect!!! Hope Callum enjoys it for many years to come! Love this room! The book closet is amazing! So creative. 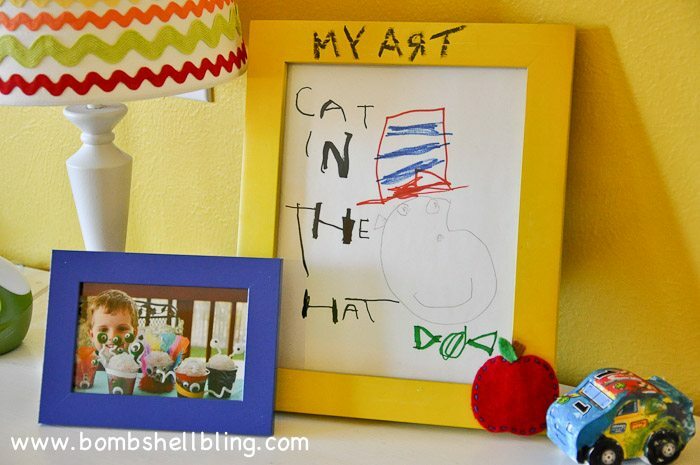 We will be moving soon and I want to decorate a room for when my my younger grandchildren visit…… I thought that Dr. Seuss would be a great choice for both the boys and girls. I love all your ideas! Thanks for sharing……my mind is in overload with all the possibilities! Yes, perfect for both genders!!! 🙂 THanks for the kind words! I absolutely love this! 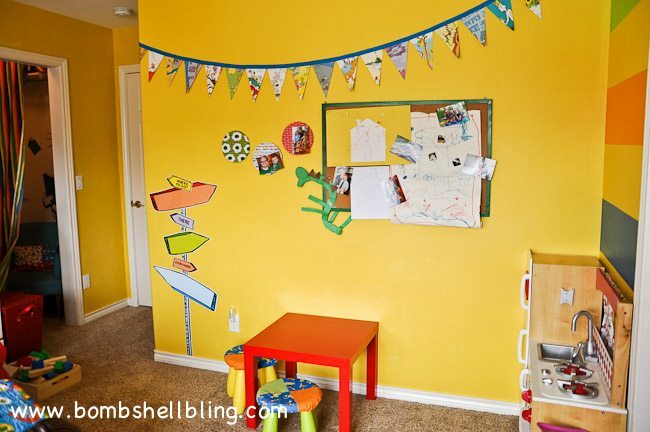 I will be adopting and would love to create a room like this! My sister is an adoptive mom, so we LOVE adoption! CONGRATS! Hey ……I love the room. I’m a pre schol teacher and I’m in love with all Dr. Seuss stuff. This past December we had a Seuss Christmas and I’m looking forward to having another one. 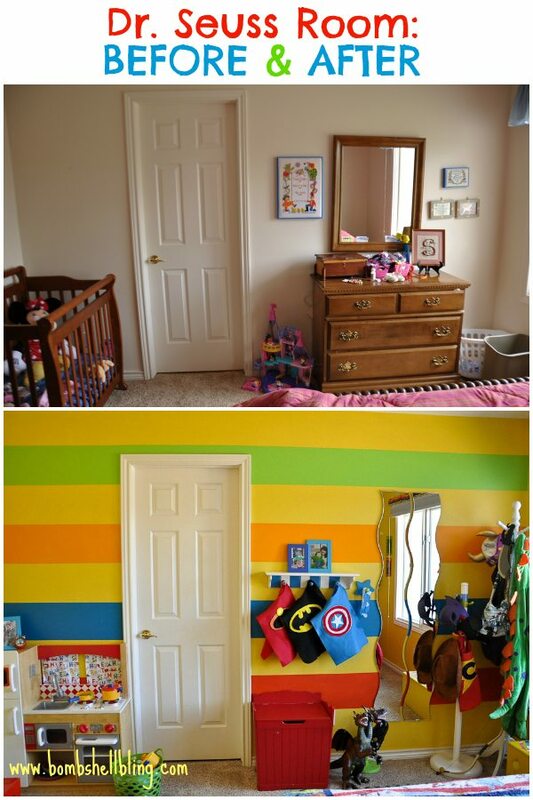 His room looks amazing! 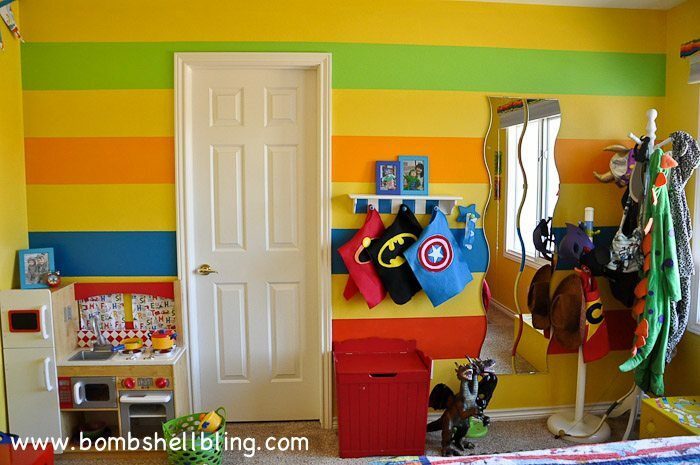 I love the “rainbow” wall. It ties everything together. 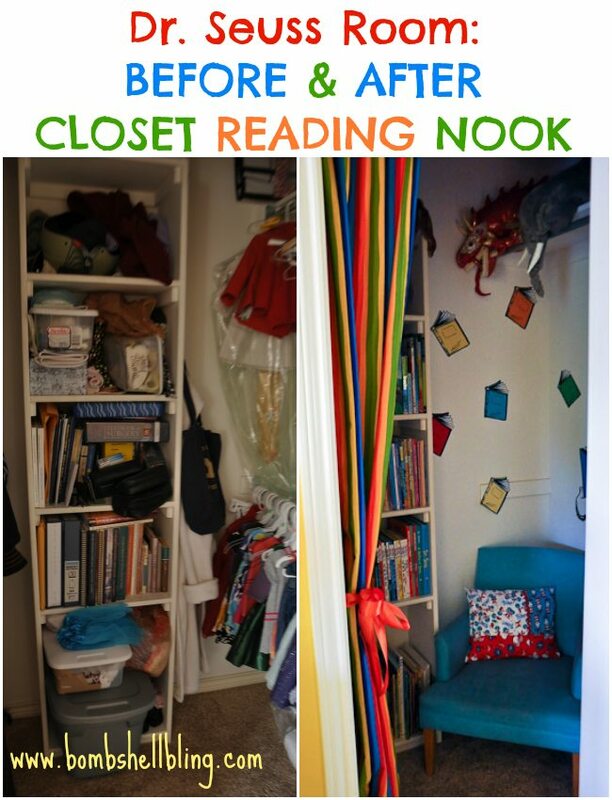 I have a question …so you turned his closet into a reading nook which by the way is a wonderful idea. Its fun and and a creative way to keep children reading. 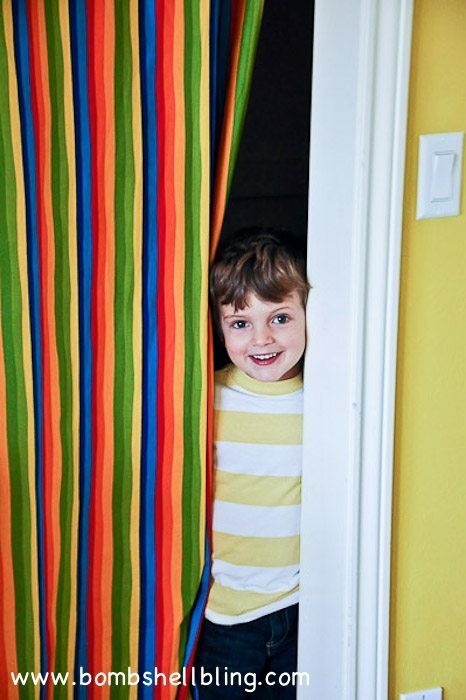 Where did you end up putting his clothes?…..
How adorable is this room? You did a great job! Thanks for sharing it with us at the Family Joy Blog Link Party this week. Please join us again next week. I’ve been a Dr Seuss fan since elementary school. Love the room and my favorite part are the Seuss trees in the corner. Great job! It’s very Dr. Seuss indeed. Love the ric rac on the lamp shades. Visiting from Craft Frenzy Friday party. All the colors look so fun! Thanks for posting on the Merry Monday Link Party! Hi Sarah! 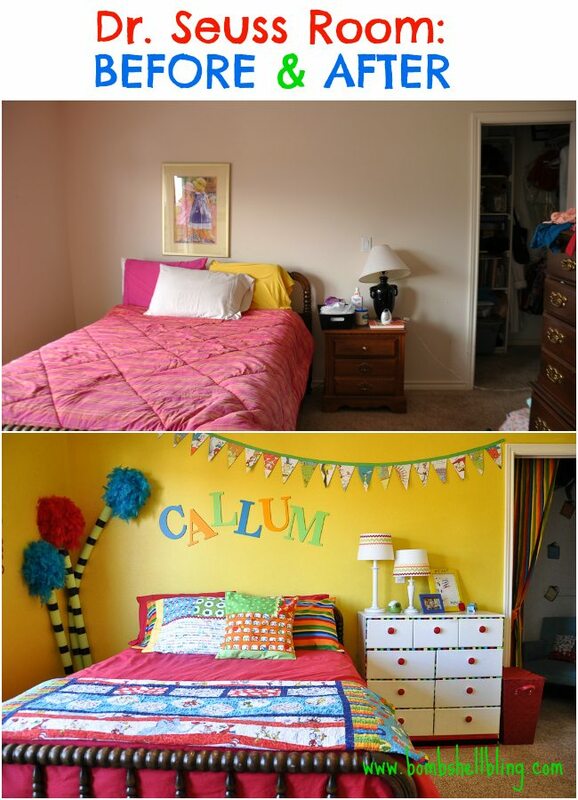 What a wonderful bedroom makeover, I absolutely love how it came out. I adore the reading nook! Thank you so much for sharing with us at Dishing It & Digging It & congratulations on being featured this week! What a fun room! 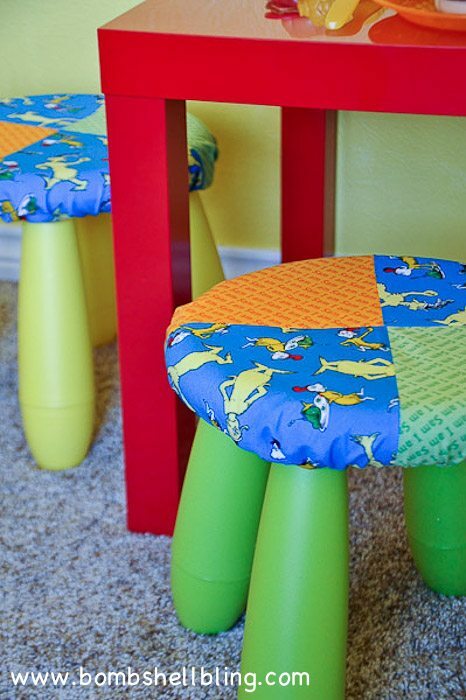 So colorful and creative! Thanks for sharing at Funtastic Friday! I’ve been working on my teens room. 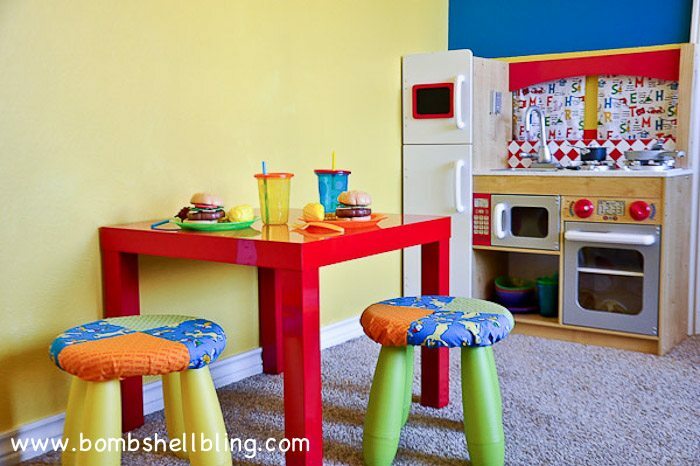 I love the colors of this room & all the great ideas. Thanks for sharing at the Inspiration Spotlight Party @DearCreatives Pinned & shared.